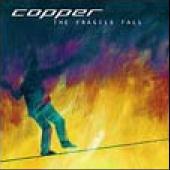 Copper's "The Fragile Fall" is an adequate modern rock record which at times comes dangerously close to being spongerock but never actually crosses the line. Balancing melodic choruses with crashing guitar chords and featuring rhythms that , for the most part, are peppy and driving, "The Fragile Fall" is at its best when it stays closer to the classic rock sound. Tracks like "Tomorrow" and "By Now" achieve this nicely while "Red Night" and "Conversation," the best tracks on the CD, go a little heavier. Other tracks tend to get annoying with their alternative flair. Not a bad record but not an especially remarkable one, "The Fragile Fall" will play better in the ears of those who like modern rockers such as Creed, Seether and other bands of their ilk. Copper: Keith Wallen - lead vocals, guitar; Shawn Lickliter - lead guitar, vocals; Brack Owens - drums, vocals; Brad Reynolds - bass. For more information, check out www.copperlive.com. Revised: 09 Dec 2018 12:03:11 -0500.